Google Scholar added the option to get email alerts when new articles related to your interests are published. For some reason, this feature is not available in Google Alerts and Google Scholar still doesn't offer feeds for search results. 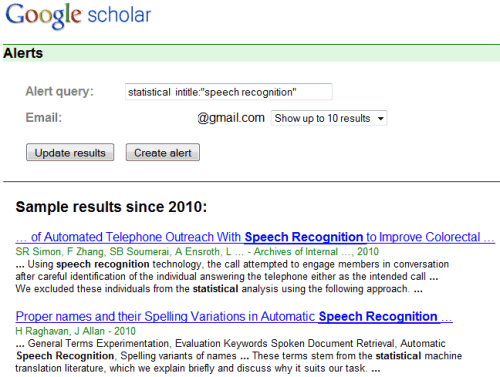 Google Scholar's email alerts feature is special because Google changes your to get better results (for example, [statistical speech recognition] has been changed to [statistical intitle:"speech recognition"]), Google shows a list of sample results and you can manage the alerts only in Google Scholar. To try the new feature, go to Google Scholar, search for something you're interested in and click on the ugly email icon placed at the top of the search results pages. 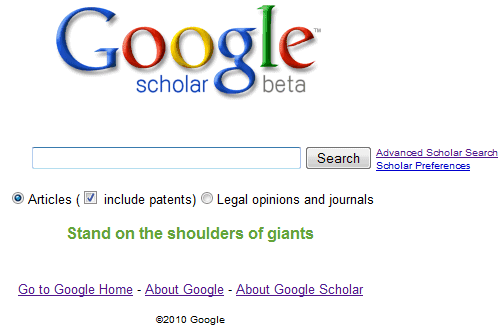 Even if it's extremely useful for students and researchers, Google Scholar has a cluttered interface with many options. It's the only Google service that uses a check box on the homepage. This is either evidence of very poor planning or just an experiment. I can't even figure out how to get back to my list of alerts without scheduling another one. I had to bookmark the alert list page. Please just leave the interface be. don't try to "simplify" it anymore by removing more choice options. How often are the Alerts updated? I tried this out on the day you launched it and have received one update, two (2) days after I received my first e-mail alerts. However, it's now three (3) days later and I haven't received any additional updates. Suggestion: Add an option for "Patents excluding articles". Personally, I'd rather keep these separate, keep my article updates separate from my patent updates. I've never liked the way CA Selects seems to randomly mix article abstracts with patent abstracts. Better to have an option to keep them separate. Let's face it, technical papers and abstracts serve very different purposes. Finally, as noted in my last sentence, you're still up against Scopus and the ISI Web of Knowledge (yes, I know it's not still called this, but it will always be "ISI" to me -- and your roots as Google date back to ISI's/Eugene Garfield's application of citation analysis). With Alerts, you're coming closer, but you still have a long way to go. Patents are nice to have, but the real test will be in who covers technical papers best. Another recommendation: Space the semiweekly updates three (3) and four (4) days apart rather than two (2) and five (5) days apart. BTW, in the second paragraph of my previous comment, I meant to say, "Let's face it, technical papers and *patents* serve very different purposes." I second the calls for RSS. I'm also confused why the alert emails are limited to 20 citations--will alerts automatically be sent as soon as this number is reached, or will excess citations between alerts simply be ignored? Many scholars need watertight alert systems to stay on top of activity in hot fields. Unless Google can increase the clarity of its methods--and allow keyword- and abstract-based searches, rather than title and full text--this service will lag far behind that of Scopus (which offers keyword-based alerts) and Web of Science (which is constrained but thorough). Note that as of today (June 10, 2010) a search limited by Journal title no longer displays the little envelope button. So, no alerts yet for new papers on specific topics in specific journals. Well, as of this week I don't see the envelope at all! This is such an important (and simple) feature - does someone have a clue what's going on? I don't understand why it keeps sending me alerts that are most definitely not scholarly. I would also like to suggest alternative search for authors. I would like to search for a list of authors, and use classical OR, XOR, AND syntax. Keep it simple, but evolving. gScholar is, in fact, a very good - and open! - complement to ISI, PubMed and other sources. How do you know to which article the alert identified a citation? It's not in the email. and then create a rule to forward all emails from scholaralerts-noreply@google.com to your custom email address at the email to RSS service. It will create a feed for you. I have created my account on Google scholar and set it az public. But still it doesn't show by name search. What can I do?